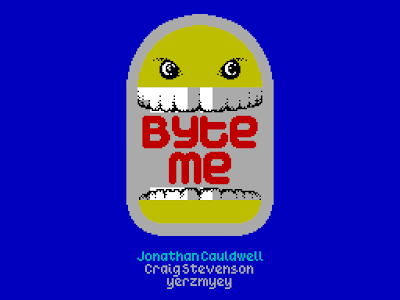 Jonathan Cauldwell's Byte Me was sold to me by my esteemed colleague (and Editor) on the basis that it would enable me to relive my days as a skivvy at a well-known fast food outlet. Despite this dubious recommendation I was prepared to give it a go and I am pleased to report that it is nowhere near as dull as the aforementioned experience. The one key difference between my (thankfully) long ago slavery to the BBQ sauce-stained masses and this simulated version is that whereas my role only contained a mild amount of peril, this has peril by the bucket-load. You take the role of a robot skivvy at a futuristic burger joint where the sesame seed buns have teeth and the hotdog rolls dream of your destruction. All you need to know is that bready products are your enemy, as are tomatoes and, presumably, little slices of pickle. These bakery aisle mutants may only be pacified by firing a sausage at them (a solution to so many of life’s challenges) or throwing a greasy burger in their direction. If you match a burger to a bun or a sausage to a roll, then grub’s up! The cholesterol-packed snack will fall onto the serving conveyor belt, ready to feed a hungry punter. The action takes place on a single screen with the conveyor belt at the bottom and two large buttons that control its direction at the top right and top left. Your enemies will warp into the arena in a random sequence, taking a few seconds to appear to give you time to take evasive action. Skivvybot must collect ammunition (hotdogs and burgers) in batches of six from crates that fall from the top of the screen, using them to destroy enemies or turn them into nutritious meals for customers. You will see the ravenous faces of customers appear, again fairly randomly, on the right and left sides of the restaurant. Don’t keep them waiting too long for their food, or they go red in the face, and I’m sure something awful happens shortly afterwards. Skivvybot must switch the direction of the conveyor by pressing the buttons to ensure that the prepared food reaches the hungry visitors - if there is no-one there, the meal will be wasted. Once you have fed a set number of customers, you will advance a level, and your task quickly becomes highly demanding (think the lunchtime rush at McDonalds). The game is well designed, with the player having to find a balance between destroying or evading enemies, making hamburgers and hotdogs by firing the correct filling at the buns, and ensuring customers are fed by controlling the conveyor belt. 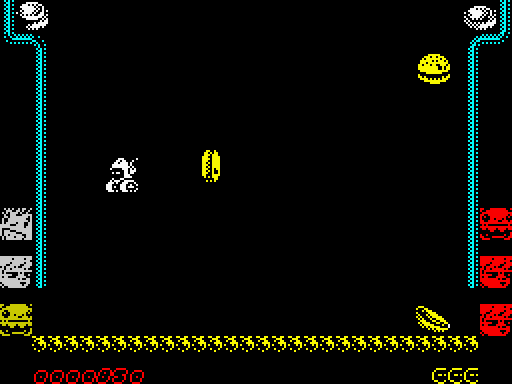 It is very tempting to let enemy numbers build up while you wait to switch your weapon from sausages to burgers (for instance) so you can turn them all into dinner - but you run the risk of getting cornered and eaten by a mutant bap. A trigger-happy skivvybot will soon run into trouble as well, because an armoury of six sausages or burgers does not last long and you’ll soon need a new batch. It is a challenging game and can be frustrating, but that’s mainly because the game-play sneakily encourages the player to take unnecessary risks (which is not intended as a criticism). The difficulty curve is a little too steep, I believe, but it is nonetheless addictive and very playable. Each level introduces more enemies and a new challenge - level two has killer tomatoes, and level three introduces bread rolls that jump back into life from the conveyor belt! I am sorry to say that I haven’t progressed further, but it isn’t from want of trying... A more gradual increase in difficulty would allow more of the game to be experienced by the player - although I appreciate that as this is an 8-Bit game it is allowed to be rock solid! The graphics are clear and well-drawn with the occasional but effective splash of colour. There is minimal clash between sprites and a nice variety in customer types. The main playing arena is clear and uncluttered and the strong game design means the lack of instructions is not an issue at all, it is very easy to pick up. (Although I must admit I do like a game with a back story - "What's my motivation, darling?") The sound effects are minimal and could have been more extensive but I find the 'warping in' sound when enemies are appearing is really effective at building a sense of urgency. The music is skilfully composed and has an appropriate breakneck tempo but for me lacked character and did not feel like it was written with the game in mind. 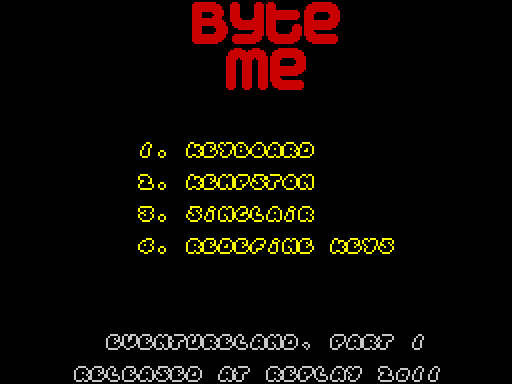 This is a good quality game that is well worth playing, especially if you are more skilful than me. With some minor improvements, some instructions, and some embellishment - and more of a gentle learning curve - it could be a great game. I really do like the title, too – how many layers of meaning can you fit into two words?